Guilford County now the most written-about North Carolina County and the War. Most of you know that I collect books. 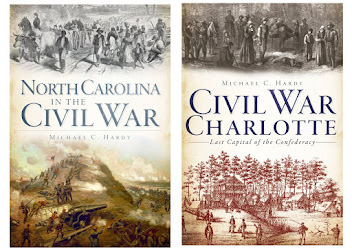 One of the cornerstones of that collection is any book that deals with North Carolina and the War. There are scores of those that line the shelves : Troops books, biographies, regimental histories, etc. Having these resources at hand helps me tremendously in the work that I do. 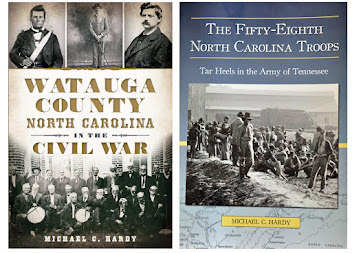 A couple of new books just coming out have propelled Guilford County and Greensboro into the lead as far as being the most written-about area of the Old North State and the War. 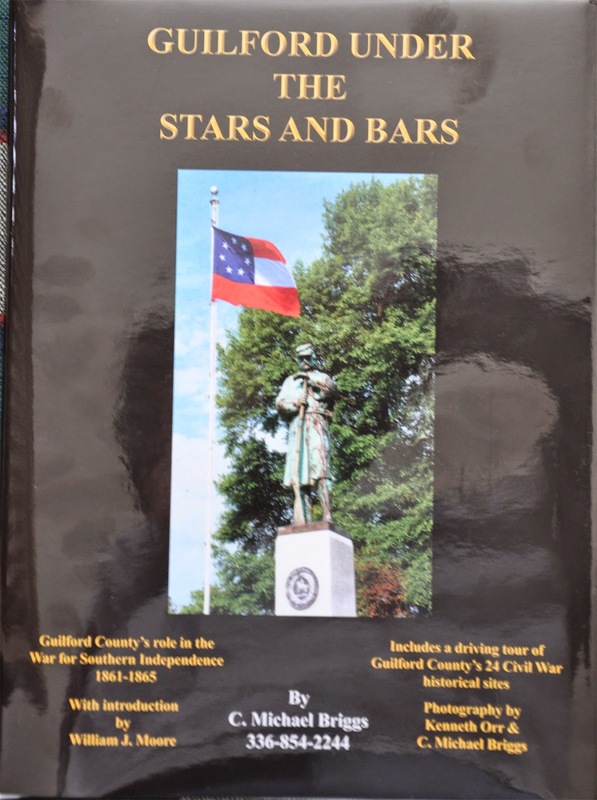 Just being released is C. Michael Brigg's Guilford under the Stars and Bars. Briggs is a Greensboro native and collector. This book (hardback, 296 pages, color and black and white photos, maps), is rich in detail, especially when it comes to the various arms manufacturing facilities around Guilford County and Stoneman's Raid in April 1865. 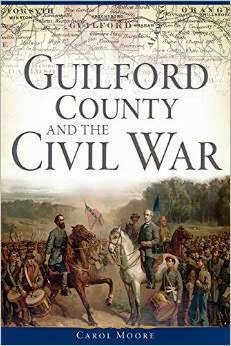 On the heels of the release of Briggs's new book is Carol Moore's new Guilford County and the Civil War. 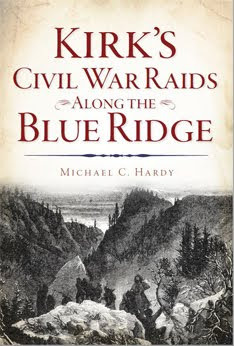 This is one of the History Press's latest Civil War Series books and will be released in late April 2015. In looking over what is available on Google books, Moore's account looks well written and will be useful for future generations. 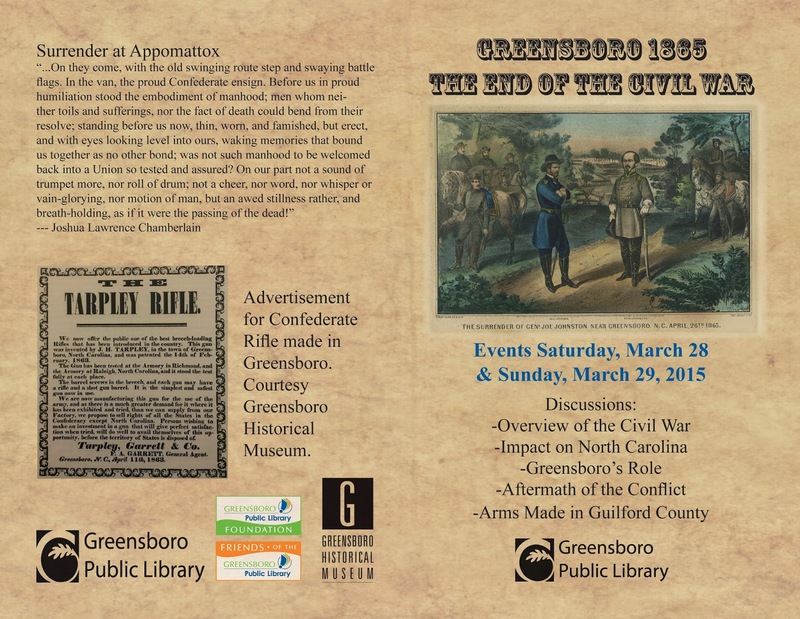 Moore is the author of an additional book on Greensboro, a part of Arcadia's Images of America series. 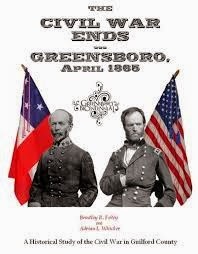 This tome is entitled Greensboro's Confederate Soldiers and was released in 2008. 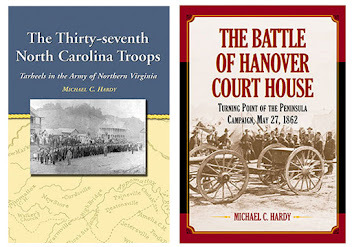 There are three books that deal with the end of the war in Greensboro/Guilford County. The first book released on Greensboro and the war was Ethel Arnett's Confederate Guns Were Stacked in Greensboro (1965). 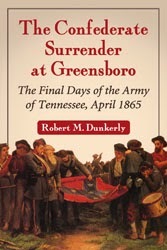 This was followed in 2008 by Bradley Foley and Adrian Whicker's The Civil War Ends, Greensboro April 1865 and in 2013, Robert M. Dunkerly's The Confederate Surrender at Greensboro- The Final Days of the Army of Tennessee, April 1865. Also touching Greensboro and the War in significant ways are Chris Hartley's Stoneman's Raid 1865 and William T. Auman's Civil War in the North Carolina Quaker Belt, released in 2014. For the foreseeable future, I believe that the events in Greensboro during the war have been adequately covered. 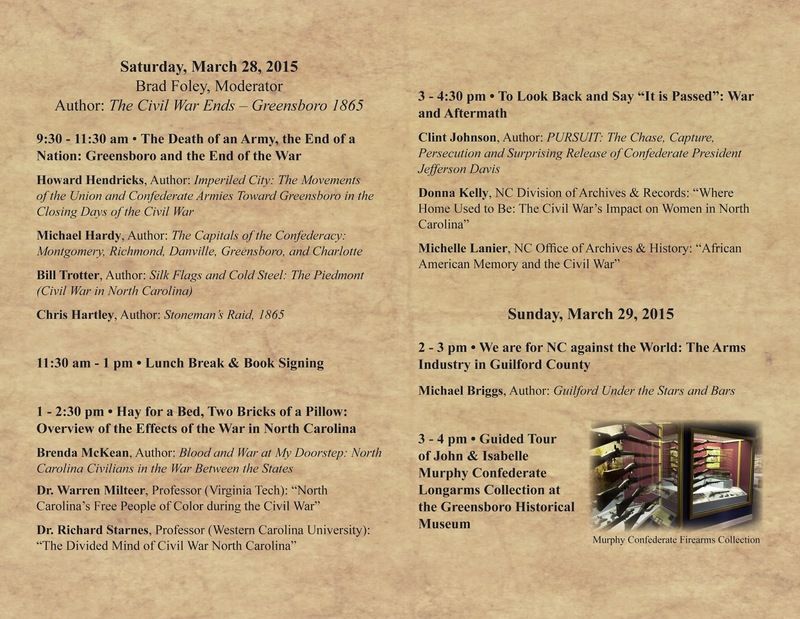 I'll be speaking in Greensboro this Saturday. If you get a chance, come and join us! One aspect of the War that has always been of interest to me is the role of transportation. In our world, we can easily travel from place to place, and find ourselves irritated when traffic, weather, mechanical issues, or accidents delay or divert our journeys or cause us to change forms of transport. However, throughout the nineteenth century, including the four years of the war, travel was often complex and convoluted. Yet, it often came with a surprising variety of choices, and sometimes at greater speed than we would expect of a world without interstates or the internal combustion engine. Most travel was conducted not from point A to Point B, in a single vehicle, but from one rail station, dock, or coach stop to another, with multiple changes of transport in between. This is true when looking at the various cities that served as a Confederate capital. When the delegates arrived in Montgomery, a few undoubtedly rode on horses or arrived by carriages. The majority came by train or by riverboat. When the first session was over, they left by the same means. In May 1861, when Jefferson Davis and a few others set out for Richmond, it was a trip that took only three days. Davis left on May 26, and arrived in Richmond on May 29. Save for the occasions when he rode out to inspect the troops in the defenses around Richmond, Davis resorted to rail travel. This includes when Davis visited the fields of Manassas in July 1861, and when he visited the Army of Tennessee in late 1863. The Confederate government took to the rails on the night of April 2, 1865. 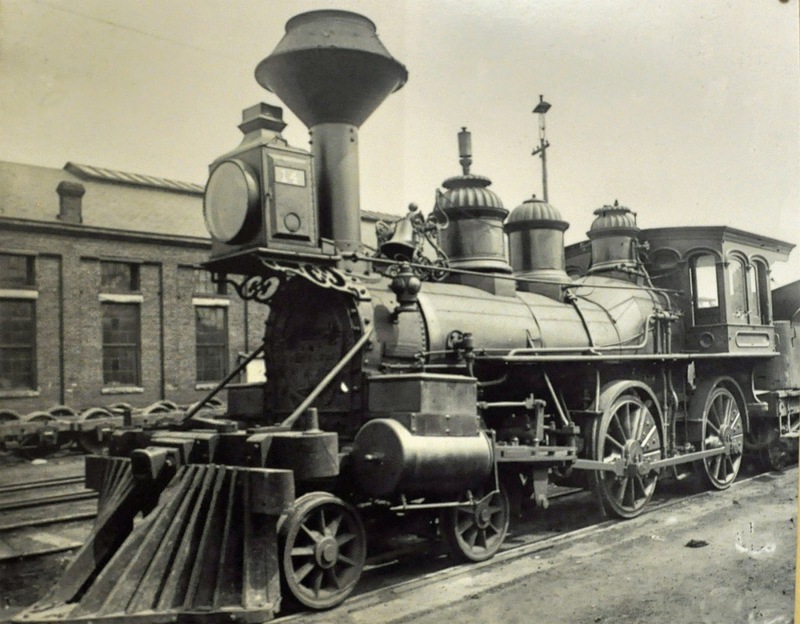 The engine that pulled the train from Richmond to Danville was the Charles Sneddon. When Davis chose to abandon Danville, he set out on one train bound for Greensboro, but that engine broke down, leaving the president and cabinet alone in the darkness while a new engine was retrieved from Danville. When it came time for Davis to move from Greensboro to Charlotte, he was forced to take to the horse once again. Stoneman's raiders had wrecked many of the lines in and around Greensboro. The image above is of the Charles Sneddon - the train last train out of Richmond. The pictures I wish I had. Every so often, some message will be floating around on facebook that goes something along these lines: "If you could go back in history for one day to observe something, when and where would you go?" Or, "If you could talk for one hour with just one person from the past, who would it be?" I've kind of developed an answer of my own. I would not want to go back for a day to observe something, but I would want to go back with a camera to take a few pictures of places and people to fill in the gaps and gather images we need to have today. Such a list could go on and on, and researching and writing The Capitals of the Confederacy has brought to the forefront my desire for several images I wish we could have. So here is my short list, an inventory of photographs I wish I could have had to complement The Capitals of the Confederacy. 1. Jefferson Davis and Alexander Stephens together, maybe even on inauguration day. I'd probably take this photo in Montgomery, namely because it rained when Davis and Stephens were inaugurated in Richmond. I would want a photograph of Davis and Stephens, a close-up on the portico of the Alabama state house in Montgomery, standing side by side, or, maybe Davis sitting and Stephens sitting, because Stephens was so small. While I am in Montgomery, I might try to get photos of the various buildings while they were being used by the Confederate government, and maybe one of Toombs, Stephens, the Cobbs, and Rhett together. 2. When the Confederate government moved to Richmond, they acquired several buildings to use as government offices. One of those buildings was the Old United States Custom's House. Davis's executive office was located in the judge's chamber. The court room was turned into a cabinet meeting room and war planning office. According to one later history, the walls were covered with large maps of both the new Confederacy and the surrounding border states. A picture of Davis's office, and the cabinet meeting would be grand. Of course, while in Richmond, there are other photographs I would take: The Confederate House and Senate chambers, in the Virginia State House, with the members at their desks. A picture of Davis's office at Spotswood Hotel (room 83) would also be nice. There are many other photos I would take in Richmond - the interior of Chimborazo, Winder, and Jackson Hospitals; the matrons and slaves/free persons of color working at those hospitals; ladies making uniforms; Camp Lee; the prostitutes who lived in Screamerville; the gravediggers plying their trade in Hollywood and Oakwood Cemeteries; Davis and his cabinet; the aftermath of the bread riots in 1863; Stonewall Jackson's funeral.... This list could probably go on for a couple of pages, but those listed would be in my top ten. 3. Following the fall of Petersburg, many left Richmond for Danville. Off the top of my head, I am not aware of any war-time photographs of Danville. I am aware of post-war photographs of some of the tobacco warehouses used as Federal prisoners, and of the Sutherlin Mansion, and a few other structures. How about a war-time photo of the Sutherlins in front of their grand home, or maybe with Davis in the front parlor? A photo of the defenses constructed outside the town would also be nice. 4. A number of war-time buildings in Danville still exist, so it is possible to get a feel for the war-time era. In Greensboro, where Davis and cabinet went next, there is really not much to see. The building that Davis stayed in is gone, and likewise, the buildings connected with the train depot. A photograph of the boxcar that the cabinet used while in Greensboro, or maybe the headquarters train of P. G. T. Beauregard would have been awesome. 5. I am quite certain that there are no war-time photos of Charlotte. I, along with other folks, have searched for years. Davis standing on the front porch of the Bates home, making his speech, would have been grand. Maybe a photo of the CS Naval works in Charlotte, the meeting of the cabinet in the bank, or even at the Phifer home around the sickbed of Trenholm would be outstanding. Or a war-time photo of the old US mint building, where the CS treasury was temporarily deposited, or even the US soldiers who garrisoned the town after the war was over. A big wish would be D. H. Hill, James H. Lane, and Charles C. Lee with the Cadets of the North Carolina Military Institute before they marched off to serve as drill masters would help me highlight several books. The woodcut above is an idealized image of Davis and his first cabinet. To my knowledge (and about everyone else's, too) it is not based on an actual photograph, but it would be fantastic to have such a photo of Davis and the entire cabinet together. Now taking orders for signed copies!!! The Capitals of the Confederacy will be released in a couple of weeks, and I am now taking pre-orders for signed copies. Books will be mailed as soon as they arrive from the publisher. Can I tell you a little about The Capitals of the Confederacy? This new book, my twentieth, looks at the places that served as the Confederate capital. The journey starts in Montgomery with the gathering of delegates from the Deep South states. These delegates form a new government based upon the old United States Constitution. 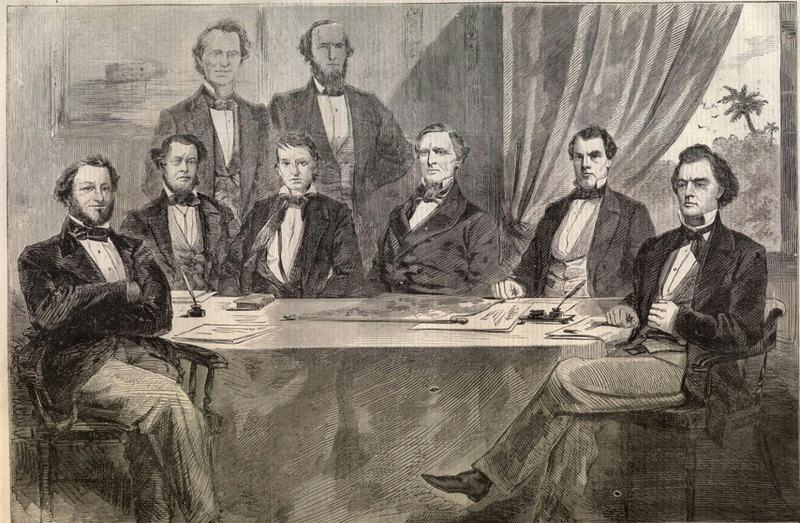 With the secession of Virginia, the government moves from Alabama to Richmond, a city much larger and, arguably, the most important in the new Confederate States of America. For four years, Richmond is the Confederate capital. On April 2, 1865, Federal forces break through Confederate defenses south of Petersburg, forcing Richmond to be evacuated. Confederate President Jefferson Davis and most of the Confederate Cabinet move to Danville, Virginia. Following the surrender of the Army of Northern Virginia, Davis and the Cabinet move to Greensboro, then Charlotte, North Carolina. In Charlotte, the Confederate government collapses. Davis moves into South Carolina, and eventually Georgia, as Cabinet members drop off at various points along the way. Davis is eventually captured on May 10 in southern Georgia. 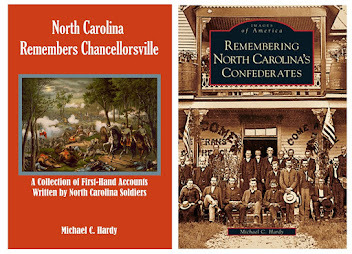 This new book looks at each of these places, from Montgomery to Charlotte, examining the role that they played and the contributions they provided the Southern Confederacy. There is even a chapter tracking Davis's movement through South Carolina and Georgia. The final chapter looks at places people can visit in five different states to learn more. Copies are $17.00, plus $3.00 shipping and handling. Checks can be sent to PO Box 393, Crossnore, NC 28616. Many times, people will ask about my favorite part of a book. Well, I like all of it. If I didn't like a part, I rewrote it! That being said, I deeply enjoyed researching the chapter on Montgomery. It is surprising that I don't write more about Alabama. Portions of my family first moved to the state in the 1840s. I have a score of Alabama ancestors who fought for the Confederacy. My dad was born in Alabama; I graduated from the University of Alabama (I could go on). However, The Capitals of the Confederacy is the first time I have ever put pen on paper and written about the state. Other parts of the book I have written about in the past. I've covered Richmond in other projects, most notably The Battle of Hanover Court House. Danville has had a mention or two, as had Greensboro in North Carolina in the Civil War as well as Tar Heels in the Army of Tennessee: The Fifty-eighth North Carolina Troops. And of course, I go into great depths about Charlotte and the War in Civil War Charlotte: Last Capital of the Confederacy. Researching and writing about Montgomery was something new, something fresh. And I had a couple of great resources, including William C. Davis's A Government of Our Own, to use. It is a really great book and I've found myself becoming a fan of Davis’s work. 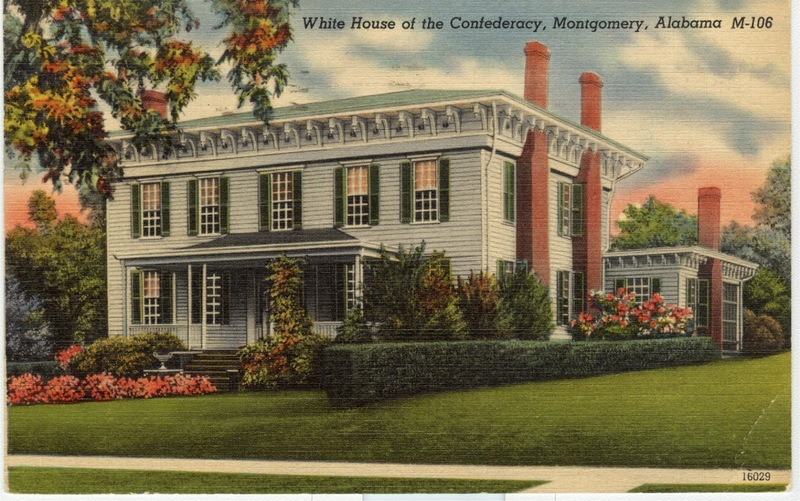 I've been to or passed through Montgomery on numerous occasions, visiting the First White House of the Confederacy and the state history museum. There is even a picture or two around here of me with the star on the state house rotunda. I'm looking forward to getting back to Montgomery and Alabama in general. It's been a couple of years since my boots trod the red clay of my ancestors. Why Capitals of the Confederacy? 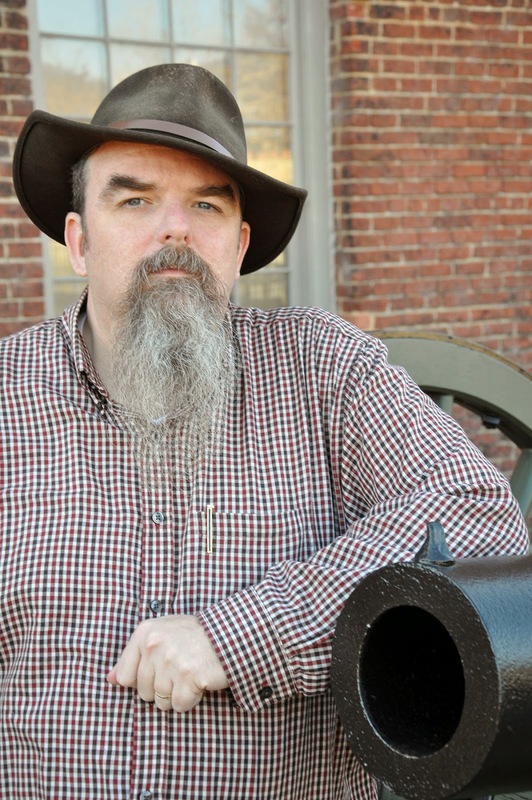 I'm about a month out from the publication of my twentieth book, The Capitals of the Confederacy. As we lead up to the event, I thought I would write a few posts dealing with the project, what I learned, and maybe answer a few questions from you. One question I get from time to time is "how do you come up with book ideas?" That's a really good question. The simplest answer would be this: whenever I am researching and writing, I notice holes in the "canon" of military history literature. I by no means have the world's largest collection of books pertaining to mid-19th century American history. But my collection is respectable. As I am working through a project, I always have my eyes open for areas that need to be covered. 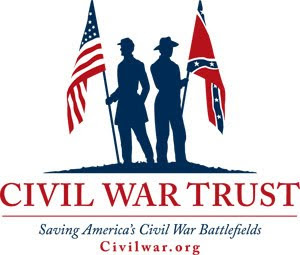 That was true when I wrote Civil War Charlotte: Last Capital of the Confederacy, just as it is true for The Capitals of the Confederacy. 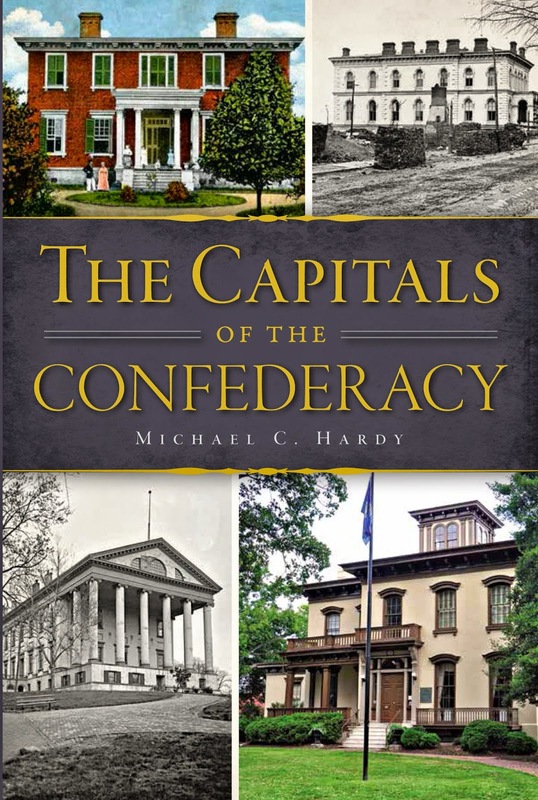 This new title looks at the places that served as Confederate capitals. 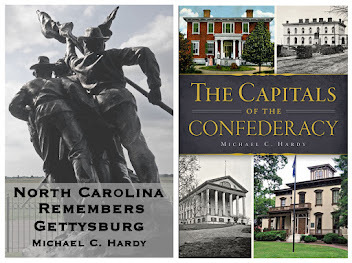 It gives the reader a glimpse of the places before the war, and how the war changed (or maybe did not change) these locations during the time they spent as Confederate capitals. 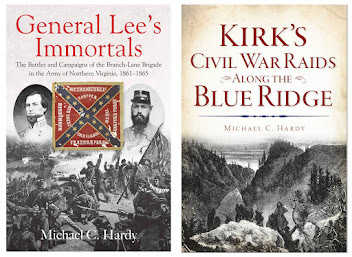 Someone might say (my editor did) "I can't believe there is not a book on the Confederate capitals already?" Surprisingly, no. There are books on the various cities: Montgomery, Richmond, Danville, Greensboro, and Charlotte, but nothing that really looks at all five places. The closest would be various biographies on Jefferson Davis. I think it might be safe to say that he was the embodiment of the Confederacy itself. And at times, it was a challenge to not have a running, day-to-day discussion about Davis. In the chapters covering Montgomery, Richmond, and Danville, I worked hard on chronicling life in the various cities and towns, while trying to keep Davis at a distance. When the president and cabinet moved from Danville to Greensboro, and then to Charlotte (and eventually into Georgia), Davis is at the center of the narrative. So that was the challenge of this book: keeping the focus on the places, while also telling the story of the people involved. To return to the original question about why we needed a book on the Confederate capitals, well, I'm not aware of a book that looks at all of these places, hence the need for a book that someone with an interest could pick up (affordably) and get an idea about what was going on during the War years.